A January report from Nasa confirmed what many of us have been fearing throughout last year, 2016 was officially the warmest year ever since modern record-keeping began in 1880. Ironically, this report was published on January 18, no more than two days prior to Donald Trump’s inauguration as president of United States. Now you may be wondering what President Trump’s inauguration has to do with the global warming. You are not to blame, hearing the president’s view on global warming surprised even the most skeptical of us. Developing alternative forms of energy was “a big mistake” President Trump said in his Crippled America book, “To begin with, the whole push for renewable energy is being driven by the wrong motivation, the mistaken belief that global climate change is being caused by carbon emissions. If you don’t buy that — and I don’t — then what we have is really just an expensive way of making the tree-huggers feel good about themselves,” he concluded. What’s more, President Trump promised to return many of the coal miners’ jobs. 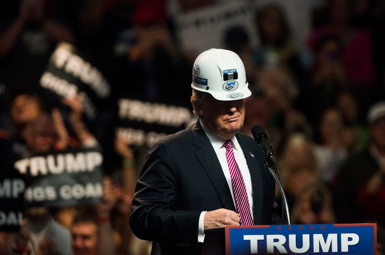 “Get ready,” he told the coal miners as part of his election campaign, “you’re going to work your asses off!” Confirming his intention to cut back on solar renewable energy and shifting focus back to coal production. So, what is going to happen to the solar energy industry, considering the fact that the president of the leading nation in solar energy does not believe in it? Research funding for wind and solar power will be cut, and money be redirected towards coal and fossil fuels. Environmental regulations, including President Obama’s modifications that emphasized the importance of renewable energy, will be changed to decrease investment in this industry. But, there’s light at the end of the tunnel for an industry that employs over 200,000 people and, according to the American Wind Energy Association, brings $245 million a year to rural property owners that lease land for renewable energy purposes, largely helping especially the impoverished rural areas of the nation. Renewable energy consumption has been expected to even surpass coal consumption by 2040, according to Environmental Impact Assessment (see figure below), and that positive momentum is not about to change anytime soon. To begin with, 29 states have already established renewable energy standards, with most citing between 15-35% as the target level of renewable energy they will be consuming within the next 10-20 years. Federal laws discontinuing incentives and funding can have no effect in state decisions, who seem boldly decided to keep investing in renewable energy. Certain states even confirmed their intention to increase investment in renewable energy if the White House decides the opposite. Meanwhile, large corporations will leverage their buying power whilst smaller companies join in the increasingly sustainable industry as well. What matters most though, is the will of the population. The general customer demand is increasingly requiring clean, affordable renewable energy, which should serve as an underlying driver for increasing investment and effort in the solar energy. Add the fact that the number of jobs generated by solar companies is fast making it one of the leading industries in the nation, and even President Trump will be convinced. To top it off, many of the Republicans are confirmed supporters of renewable energy already, with Trump’s choice for Energy Secretary, former Texas Gov. Rick Perry, championing determined deployment of solar during his governing tenure in Texas. Ultimately, President Trump’s policy changes might put a small dent on the solar renewable energy’s growth, but is not expected to have a drastic effect on it. Especially considering that such measures would hurt the creation of jobs within US, and provide the opportunity for the likes of Russia and China, United States’ main rivals, to lead the development of such a crucial industry.